Euro-2012 | See you in Ukraine! 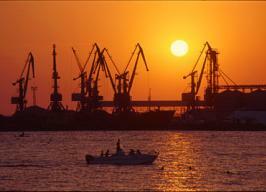 Modern Odesa is the largest seaport of Ukraine located on shores of the Black Sea, the city of great historical, cultural and industrial significance. Its mild climate, beautiful sand beaches and numerous historical landmarks make Odesa a natural resort city and, as if it was a precious gem boasts of its beauty in the South of Ukraine. Founded in 1794 by order of Queen Katherine the Second with the purpose of establishing a mighty seaport, fortifying southern borders of the Russian Empire, Odesa has surpassed Her Majesty expectations. The ancient center of Slavic culture, the Mother of all Old Russian cities, the Majestic, the City of Gardens — these are but a few names attributed to Kyiv. 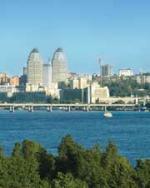 All of them, however, fail to convey the exact meaning of the city nestled nobly on the banks of the Dnipro River. Donetsk, the city of blacksmiths? “Yes, without a doubt,” a native resident of the city of metallurgists, and at same time the city of million roses, will reply to you with pride. The history of the capital of Donbas, Ukraine’s largest industrial region, started right from a blacksmith's shop. Back in 1869, a British entrepreneur, John James Hughes, built a blacksmith’s shop in the wild steppe and it became the first workshop of a powerful metallurgical plant, and later, all of that transformed into a developed metropolis. Dnipropetrovs’k. Is Dnepr on the Dnipro River? Dnipropetrovs’k, the third largest Ukrainian metropolis, is located 479 km in the southeastern direction from Kyiv, the capital of the country, down the course of the Dnipro River. Once it was called Katerynoslav, in honor of Russian Empress Catherine the Great. It was her idea to found here “the Southern Palmyra” of the Russian Empire back in 1776. Kharkiv. Is the first capital? Kharkiv, Ukraine’s second largest city, is located 470 km east of Kyiv. 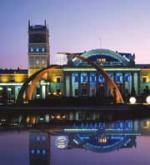 The city’s native residents like to remind their guests that it is the first capital of Ukraine. Indeed, during a difficult period in Ukrainian history, from 1917 to 1934, the city was the capital of the Ukrainian Soviet Socialist Republic. But even until now, Kharkiv has not lost its economic and scientific relevance. 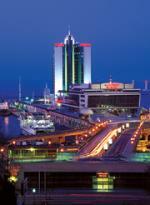 The city is a large industrial center and yet, it is very hospitable to its visitors. Less than an hour by air from Warsaw or Kyiv, with connecting flights from all over the world, Lviv is easy to open the western gates to Ukraine and to get to treasure yet to be discovered by many people. Often referred to as “Little Paris” or “Ukrainian Pie Monte”, Lviv hosts more than half of all the historic sites found in Ukraine. Because of the abundance of architectural and historic monuments, the city was recognized by the UNESCO World Heritage Committee as a treasure house of culture.